February 23, 2015 February 28, 2015 ~ Trevis Dampier Sr. 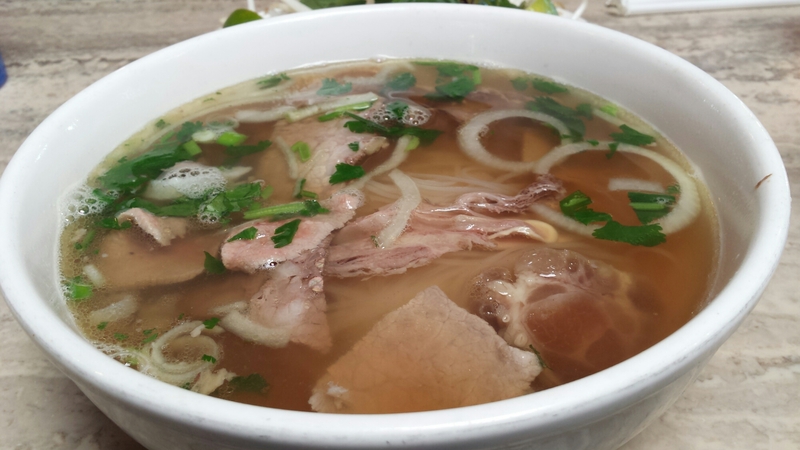 I have eaten at tons of Pho restaurants in the Bay Area and trust me we have tons to choose from but when I have a choice then I am choosing Pho Minh in Cupertino, Ca. First thing I need to do is give you a brief description of what you will experience in this soup. The usual type of noodles you eat in Pho are rice noodles which are long thin noodles and you will have a choice of meat or veggies that you would like your soup to come with. The soup will arrive with a special made broth that will give you a good fix of sodium and flavor so be aware of that if you are trying to cut down on sodium. Trust me though.. it is well worth it! I love the different textures of the meats within my Pho soup so I always order Rare Steak, Well-done Flank, Tendon, & Tripe. This gives me some tender bites and a little interaction of chewy type textures as well. Tendon and tripe may not make a good dish on its own but with Pho it works wonders! The soup is really hot (not scolding but hot) and the meats are cut thin so don’t worry about buying the rare steak, it will be nice and tender by the time you finish placing the bean sprouts in the soup with it so don’t worry about it being uncooked. Since I mentioned the bean sprouts, let’s talk a bit about how to garnish this lovely piece of artwork of a soup. 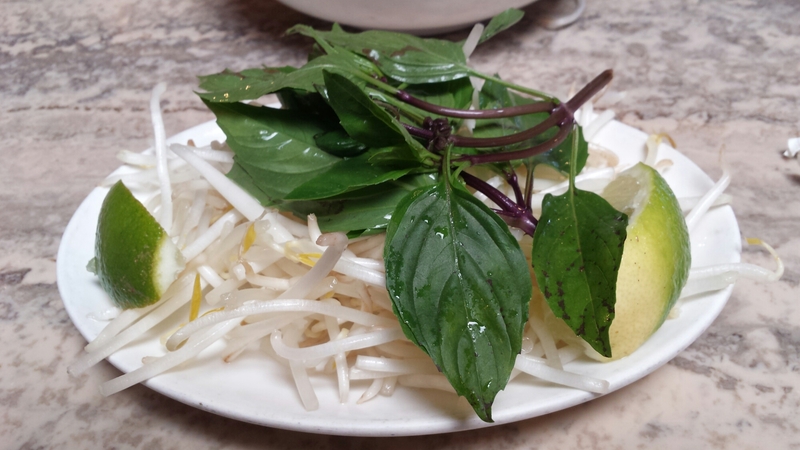 You will usually have a separate plate given to you with your soup with garnishes such as lime, bean sprouts, and cinnamon basil leaves. Hoisin sauce and hot sauce (Sriracha) usually are sitting at your table already along with salt and pepper which most likely you won’t need to use. Virginia taught me well so I will pass that lesson on to you. Make sure you you grab the basil leaves and pick them off one by one and then drop them into your Pho bowl along with a handful of sprouts as well. Following that, squeeze the lime juice into your Pho bowl and then proceed to squeeze about a tablespoon of Hoisin sauce into your bowl and then taste to see if you want to add more. Once my soup is complete there is another delicacy you will find at a Pho Restaurant and that is the egg rolls. They usually have a choice of meat egg rolls or veggie egg rolls. 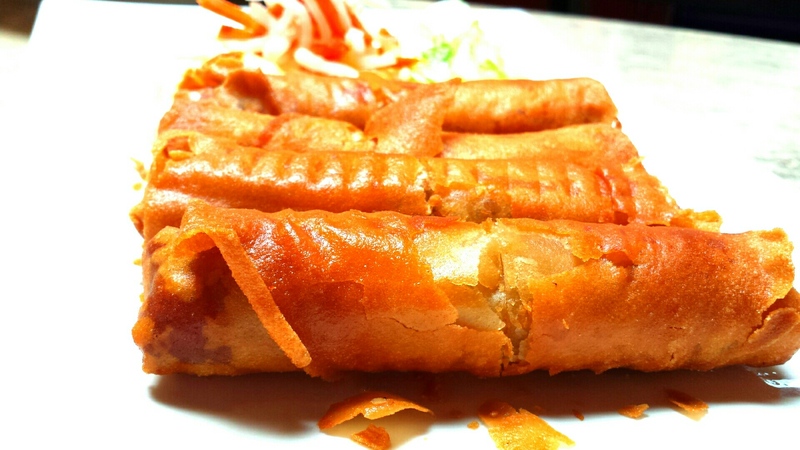 If you are allergic to shellfish be careful with the meat egg rolls because most of them are mixed with pork and crab and chicken. Here at Pho Minh in Cupertino, Ca they are really crunchy and packed with flavor! They also give you a dipping sauce which seems to be a type of flavored fish sauce. Really delicious! I highly recommend you add the egg rolls to your lunch or dinner as well; the combination of the crunch, the sodium overload, and the burst of decadence in one sitting with something that seems so simple will have you screaming for more. Now that’s live action eating! < Previous Breakfast of Champions…. Next > Top-Tier Food Truck Tuesday’s!! !